What´s the name of your band? The name of our band is Aeveron, which is a fantasy name created by our former guitarist Kay. It describes the world we are living in when making music. How was the band formed? The band was formed back in March 2002 when 6 adept musicians who had already collected various experience in other formations, decided to unify their diverse musical influences in one formation. Can you tell about your band? We are playing Melodic Death Metal that is mainly influenced by the Swedish Death Metal scene but also incorporates various other Metal genres such as Black Metal, Thrash Metal and traditional Heavy Metal. Where are all band members from?/Who does what in the band? All current band members, except myself, are living in Saxony (a Federal State in the east of Germany). I am living in Baden-Württemberg, which is situated in the southwest. I am the singer, as I have already mentioned. Then there is Paul, our drummer, Dirk, the bass player, and Jens, the guitarist. Unfortunately, our keyboard player Markus recently decided to leave the band. So, we are still searching for a second guitar player and a keyboardist. What was the ambitions of the band when you started? There were no real ambitions back then. We just wanted to play the music we liked. So, no rockstar attitudes. Could you explain your music to someone that haven't heard you? Hmm, that's not easy. If you like Melodic Death Metal that also has other genre influences, then Aeveron won't disappoint you. Our music is brutal and harsh on the one hand but can be harmonious and very melodic, too. Where was your first gig? That was at a small indoor festival in the year 2002 in the city of Annaberg in Saxony. Where was the latest gig? Our latest gig was at the Chronical Moshers Open Air 2014 in June. Who writes your songs?/Who writes the music who writes lyrics? The song ideas and riffs are mainly written by Jens, our guitarist, and then completed together with the rest of the band. Who has the best sense of humor in the band? Can't really say that. All of us have a very special sense of humour and can be very funny at times. What's good/bad with the band?/What genre do you feel you are? Good about the band is the fact that we are creating music we like and that there are people who also like that style of music and buy our records or come to our live shows. Bad about the band are the numerous line up changes we had to face in the last 12 years. Particularly the guitarists were literally coming and going. 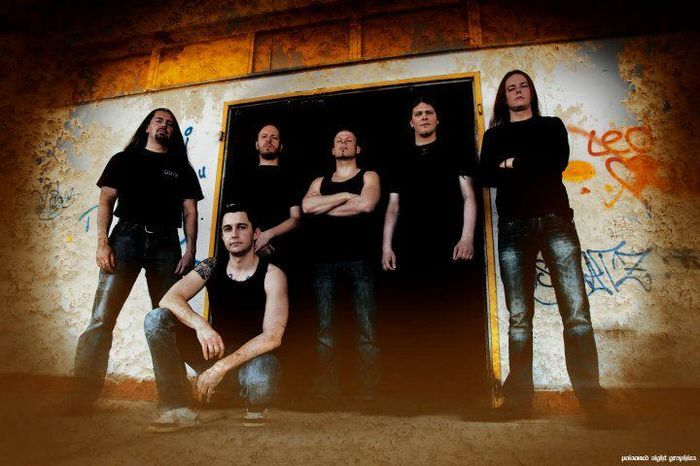 And of course, the departure of Markus, our keyboardist, who was a founding member of Aeveron, is a sad thing for us. As I have already mentioned, we are playing a kind of Melodic Death Metal, highly influenced by the Swedish scene. That's why we would suggest to call our music Melodic Sweden Death. Why did you pick that particular style?/What are your songs about? We did not literally choose that particular style, it just came naturally. Because that is the music we like to hear. Our songs are mainly about more or less negative topics like the downfall of mankind, death, depression and that kind of things. But there were also some songs, whose lyrics were written by our former guitarist, that had a more positive approach. Do you write your own material or mainly covers? Yes, we do write our own songs, although we have also played several covers throughout our career, mainly live. Have you made any albums?/If yes what are they?Yes, we have recorded three full albums, one mini album and a demo so far. The demo was recorded in 2003 in our drummer's apartment. In 2004, we released our debut album „Construality“. In 2006, our mini album „The Ancient Realm“ saw the light of day. Two years later, in 2008, our second full album „Existential Dead End“ was released, followed in 2011 by our latest record „Impending Doom“. Currently, we are writing songs for a new album, which will be recorded in early 2015. How old are you? Paul, Dirk and I are in our mid thirties and Jens is in its late twenties. At what age did you start playing? We started in 2002, so most of us were 22 or 23 at that time. How old were you guys when you first stood on stage? The same age we were when we started the band since the first gig was in 2002. Best/worst gig you've played? The best gig was probably the one with Manegarm, Skyforger and Goddess Of Desire in 2005. The worst was a gig in a small club in Saxony in 2007. Our former guitarist Kay did not arrive at the gig and told us on the phone that we should play the gig with one guitar. The show itself went pretty well and the audience was cool but the situation that Kay left us high and dry was not very nice. We kicked him out afterwards. What places will you be playing in in the immediate future? Since we are in the song writing process at the moment, there are no live shows planned for the near future. But after the album has been recorded, we will be playing live again. Where have you played from then till now? We have had lots of gigs in Saxony and other Federal States of Germany. We were in Austria, Switzerland and the Czech Republic. For the future it would be cool to have more shows in the West, for example Belgium, the Netherlands, France and so on. But we will see. Which band is the best you´ve seen? Oh, that's a tough one. Maybe that was Symphony X but there were so many other great bands I have seen live. Is it always the same songs live? Most of the time. But the setlist changes every now and then, for example when we have a new record out. Have you had any bigger tours from start to now? Nope. We only had mini tours that lasted for two days. Longer tours are difficult for us to manage since we all work full time jobs. What are the plans for the rest of the year? Like I have said before, we are in the process of song writing and will record the new album in the beginning of 2015. What are your goals with your music? We no longer have any real goals. We just wanna make music as long as possible and if someone likes that we are happy with that. We have abandoned the idea of becoming rich and famous with our music long ago. We are satisfied with playing live shows and presenting our music to other like-minded people. When did you decide to go all in for the music? I personally started to be a vocalist in 1999 because I had always enjoyed singing along to my favourite bands and thought that it would be cool to do that on my own. Is it easier to get your inspiration from older bands or from bands more modern? Neither the one nor the other. We don't deliberately listen to classics or modern bands and then write a song from that inspiration. It all comes naturally and only after you have written the song you realize certain influences. What are your sources of inspiration? Life and all its difficulties are a huge source of inspiration. What's the first step when making a new song? Like I have mentioned before, Jens comes with some riffs or the concept of a new song and then Paul writes drums on these riffs and so the song gets a shape. After that the bass line is written on that. The vocals come at the end. How do you feel about the downloading of music instead of buying albums? That is a very problematic situation indeed. Personally, I have downloaded other band's records as well. But for a small band playing in the underground it's not good at all. On the other hand, even if the people download your stuff, you will get some popularity. What would be your dreams for the band? Playing some gigs in the western part of Germany and Europe would be awesome. Besides your own music, what genres and bands do you listen to? Several years ago I only listened to brutal stuff like Death, Grind and Black Metal but in the last few years I have broadened my musical taste and now also like Power Metal, Progressive Metal or Melodic Metal. But this is my personal taste. I can't speak for the other members here. What would be your greatest fears for the future? The greatest fear would be another line up change. I really hope that we will find new musicians to fill the gaps and that we can continue as a full band. When you are on stage, what do you fear most then? I personally am afraid that my voice fails and that the whole live show would be a complete disaster. Have you been in any other bands? I have been in two other bands while I was singing in Aeveron as well. The one band called Inexorable played technical Death Metal and the other band called Coming Fall played blackened Death Metal. But at the moment I am only singing in Aeveron as a full time member. Dirk, our bass player, was in a band called Xiom and Paul is involved in various projects and bands. What do you work with outside of the band and the music? I am working as a writer for a company that operates several online shops. The others also work full time jobs. How important are your fans? Definitely very important. We would be nothing without them. They buy our music and come to our shows. What's the funniest/most memorable thing a fan has done for you? Once, when we were on stage I was very thirsty and had no beer left. A fan saw that and brought me a beer. That was very cool. How often do you rehearse? Since I am not living in the same region with the other guys I can't rehearse on a regular basis. But the rest of the band tries to rehearse once a week. Where do you rehearse? In a old company building which has several rehearsal rooms. Other bands rehearse there as well. Name 2 of your own songs you like at the moment? I really like our new songs which don't have names at the moment. But I really like the title track of our record „Existential Dead End“ and the song „The Niche“ from „Impending Doom“. What drives a band that isn't all that famous and renowned to try to make a living on their music and to keep playing? Since we are not trying to make a living with our music anymore it is not neccessary to driving ourselves. We are doing what we like and if we can earn a little extra money with it, that is fine with us. Any pearls of wisdom for all other bands out there? Just be yourselves and don't let others change you just to make a quick dollar. You will regret it one day. Describe your show, visually and musically. Just an energetic live show with good music. No pyros, stupid painted faces or other senseless props. Just pure and honest metal music. How do you view the music industry of today? Crowded. There are just too many bands and most of them are crap. But they get hyped by the big record labels. I think it's time for another cleansing of the scene. At the end only the best will prevail. What are the biggest obstacles for a band? Today it is very hard for a band to get good live gigs. Most of the clubs out there are offering you the pay to play option which is a total crappy system. So, the only way for a young band to get to play live is either good connections or other bands they can play with as a support. Tell us about upcoming gigs and why we should be at them? Like I have written above, this year there won't be any concerts. But watch out for 2015 when we will be playing the clubs of Germany with our new album. You should not miss out. How would you describe your sound in one sentence? We play melodic but harsh and aggressive metal music. What was one of the most quarrelsome times for you in the band? For sure, these were the times when our guitarist Robert left the band in 2005 prior to our studio recordings of our mini album „The Ancient Realm“, the departure of our other guitarist Kay in 2007, the departure of our two! guitarists Alex and Matze in 2012 and now the loss of our keyboard player Markus recently. Hopefully we will finally find new members who stay in the band for a longer time. Do you have anything to add? Thanks again Robex for the interview and the interest in Aeveron. Maybe there will be someone reading this stuff here and asking us to play in Sweden one day. Who knows.